Brad is fuming that his horse lost. Lauren says that Brad shouldn't expect to win every single time he bets. Lauren explains that horses are temperamental creatures and that a lot can happen between the saddling paddock and the track. Brad is grumbling as he only backed her tip as his horse was a non-runner. Lauren advises him to give the race a miss the next time that happens. BRAD: There's got to be a sure fire system out there somewhere. LAUREN: Then how come the TAB makes such a nice profit?! Brad answers the door to Wayne, who's looking for Gaby. Brad and Lauren explain that she's doing a business deal at Lassiter's. Brad wants to know if Gaby and Wayne are on or off, and Wayne tells him that's what he's come around to find out! Lauren tells Wayne that Gaby took a cab, so she'd probably appreciate a lift home. Wayne isn't keen on hanging around Lassiter's, but when Brad thinks that she shouldn't be late, he says he might go to pick her up. Wayne asks how Brad's going with the horses. Brad tells him that he's just made an important discovery - never listen to the experts! Lauren hits him with the paper! Jack has made drinks for himself and Gaby. He tells Gaby that he got the impression that she didn't like him from their first meeting. Gaby brushes it off and says that the dinner party was just a poor one - doomed from the start as Julie was in a filthy mood and business meals aren't Wayne's cup of tea! 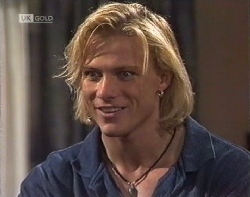 Jack presses Gaby for how serious her relationship with Wayne is. Gaby brushes it off, saying they go out occasionally. Jack notes that Wayne seemed interested in her. Jack has rather turned the charm on at this point! Gaby thinks that Wayne would've been happier at home watching the football on the telly. Jack guesses that Gaby isn't the sporty type. JACK: On whom you're playing with, right? GABY: I suppose so. How about you? JACK: It'd be a shame to waste that outfit on room service. (Double ooo err!) Jack wants to know what to order and Gaby says she'll leave the decision to him. Hannah and Julie are gushing over some new clothes that Julie has bought for her. Debbie walks in, and Julie talks about getting rid of some of Hannah's old stuff that she's grown out of. Debbie asks when they're going shopping to get her some new clothes. JULIE: Oh, for goodness sakes, Deb, you've got stacks of clothes! DEBBIE: Most of it's older than I am! Julie tells her not to exaggerate. Debbie stresses that she does need some new things and Julie agrees to go through her stuff when she's sorted Hannah out. Debbie tells her that she doesn't need to sort through - Debbie already knows what needs buying. JULIE: Seems to me, Deb, you've always got your hand out. You drove your father mad for a new dress for the dance. And you always want extra money for a film or excursion or some such thing. DEBBIE: I don't cost you half of what Hannah does! DEBBIE: (annoyed) Oh right, so everyone else can go jump as long as little Hannah gets everything she wants! JULIE: That's not true. I don't show favouritism, and you know it. DEBBIE: Tell that to Michael. JULIE: (after her) The way you're whinging, Debbie, you're beginnning to sound like that brother of yours. 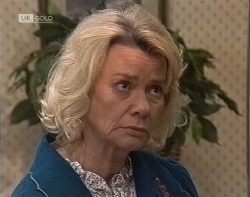 Debbie angrily turns back and glares at Julie and Hannah. Hannah sticks her tongue out at her. Michael is mopping the floor. An officer comes over to him and tells him that he's got good news - the superintendent has approved Michael's weekend release. Michael is absolutely stoked. The officer tells him that he has to arrange it with his parents to see if they approve. Michael excitedly asks if he can call them, but the officer tells him to do it tomorrow. Michael waxes lyrical about how great it'll be to see them and to finally get out of the detention centre for a while. He realises that he's insulted the centre and almost looking scared, breaks off and starts his mopping again. The officer stops him and tells him to relax. He tells Michael that he's made a huge effort and he's earnt his reward. Michael worries that his parents might not be ok with him being home, but the officer is certain that they'll be looking forward to it as much as he is. The officer leaves and Michael carries on mopping, with a huge grin on his face. Helen is eating her dinner alone and is drinking wine. She's pretty miserable, and then Debbie bursts in. HELEN: (coldly) No, she had better things to do. Helen says she'll tell Annalise that she called around, but Debbie says that she came to see Helen. Helen perks up and offers Debbie some food, but Debbie declines. Debbie tells Helen that she had to get out of 32 - Julie's been driving her up the wall since she came home from Queensland. HELEN: Why would she do that? DEBBIE: She just seems different. She's all over Hannah but as far as she's concerned, the rest of us can drop dead! HELEN: Oh well, Hannah's still very young. Your mother probably realised that she fretted whilst she was away. DEBBIE: No, she's being really awful to Dad too. HELEN: (sternly) Now *that* is a subject neither of us should be discussing. DEBBIE: She's being the pits, Gran! She's bought Hannah a whole heap of new things but there's no way she's going to get me anything new! HELEN: (coldly) Do you know, Debbie, I'm getting a little bored with people who only come to see me because they have problems. (angrily) Quite frankly I'm beginning to think that no company at all is better than being used as the Ramsay Street wailing wall! Helen storms off. Debbie looks stunned! Michael is mopping a bedroom. His roommate - Freddo - swings in and asks if Michael's clear for the weekend. Michael tells him that he just has to clear it with his parents. Freddo is pleased and talks about how happy he is to be getting out. Michael points out that when Freddo goes, he'll be gone forever - Michael's only getting weekend release. FREDDO: Still, better than a poke in the eye! Michael agrees. He asks Freddo what his plans are. Freddo tells him he's heard stories of a guy going to Darwin and getting work on the prawn boats. He thinks that's the best way to make a lot of cash quickly. Michael thinks it sounds like hard work but Freddo reckons that if you get in with the right crowd it'll be ok! Freddo carries on dreaming as they walk through to the next room. Freddo tells him that once he gets the cash together he's going to go to Thailand and see all of the 'neat places that we see on telly'. He says he can live real cheap in Thailand so he's just going to lie around on beaches until the cash runs out! Freddo seems to think that just being able to speak English will be his sure fire way to pick up money from tourists. As Michael's about to start mopping the next room, another lad appears in the doorway and interrupts them. DARREN: You talk a load of rubbish. Michael drops his mop and strides over to Darren. He shuts the door in Darren's face. Darren merely opens it again! DARREN: Why do you let him rave on? Everyone knows Freddo's a liar. He couldn't lie straight in bed if he tried! FREDDO: (indignantly) I am so going up north! DARREN: Yeah, flying first class, chatting up the hosties(!) I can see it now, mate(!) Now, if we're talking about me, there'd be some sense in it. It's more my style. MICHAEL: How you got release, I'll never know. DARREN: (winking) It's not what you know, mate, it's who you know. MICHAEL: (angrily) So what?! You'll be back here as fast as you went out. DARREN: Yeah, but at least I get to do my own thing. Not like you, getting sent home to Mummy and Daddy. Darren strides into the room and kicks Michael's bucket of water over Michael's feet. Darren walks out, turns back to see the mess and laughs to himself. Michael and Freddo look at him with pure hatred. Jack and Gaby are having a meal together. Jack is clearly chatting up Gaby and remarks on her feline qualities(!) and wonders if she'll scratch or purr(!). He talks about the mystery and challenge, and Gaby seems uncomfortable. She turns the question of 'how do you like to drink champagne?' back on him, and he tells her in the spa! Gaby looks very uncomfortable! Jack gets up and approaches her. JACK: Nothing more sensual than letting those hot jets set your naked skin tingling while you sip a glass of iced Bollinger. In the right company, of course. GABY: (tightly) It sounds wonderful. JACK: Well, don't take my word for it. Gaby bolts! She gets up and tells him that she should be making tracks. Jack beams and as she goes through the door, he laughs loudly. Gaby hears him and returns. JACK: You couldn't go through with it. I've met ladies who would go a lot further than champagne in a spa to get what they wanted. Somehow I didn't think it was your style. GABY: Was that a compliment or not? Gaby is upset and thinks that she's blown things. Jack tells her that's not the way he likes to operate and he knew what was going on from the moment she turned up. JACK: I'm really glad you changed your mind. We see Wayne walking around the corner. He sees Gaby and Jack in the doorway of Jack's room, where Gaby thanks Jack for the champagne. He gives her a friendly kiss goodbye and shuts the door. Gaby turns and is stunned to see Wayne. WAYNE: I could ask you the same. But I don't need to, do I? It's the next morning and Brad, Gaby and Lauren are arranging breakfast. Gaby grumbles about Brad letting the cat out of the bag to Wayne. Brad protests that he didn't know she was off chasing another bloke. Gaby insists that she wasn't - and she didn't appreciate them sending Wayne to spy on her! Lauren points out that Wayne was only going to give her a lift home. GABY: That's his story! I don't need Mr Teacher telling me what I should and shouldn't do! LAUREN: (unsure) I thought you really liked him? GABY: (annoyed) ...oh, well, think again! BRAD: (chirpily) I bet you were up to something, otherwise you wouldn't be so mad at yourself! Gaby flies at Brad! She tells him that it was strictly business and if he'd kept his mouth shut, Wayne would've been none the wiser. Brad shrugs and tells her to sort it out with Wayne. He leaves. Lauren confides in Gaby that she's worried about Brad's gambling. 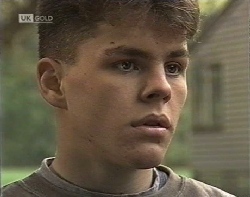 GABY: If little brother Bradley has a problem, he can sort it out himself. Lauren says she doesn't know who else to talk to. Gaby tells Lauren that Pam and Doug have tried to talk to him and if they can't make him see sense, there's no point her trying. Lauren looks worried. Julie is brushing Hannah's hair. Debbie walks in. Julie comments on how pleased she is they've tried a new shampoo - it's given Hannah's hair a lovely shine. HANNAH: (pointedly) Debbie wants to use it but you bought it for *me*, didn't you? Debbie asks for some pocket money. Julie rolls her eyes, thinking that Debbie is always asking for money, and says that Debbie will only blow it on junk food. Debbie thinks it's unfair that Hannah and Julie are going out for the day - she should have something as well. Julie tells Debbie that she can go to the fun park too, but Debbie scornfully tells her that it's not her idea of a good time! The phone rings. Philip yells (from offscreen) that he'll get it. Philip picks up the phone. To his surprise, it's Michael. MICHAEL: I got weekend release coming up. MICHAEL: Is it ok to come home? 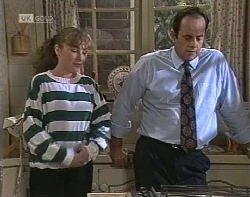 Philip pauses as he can hear an argument going on in the kitchen, where Julie is rebuking Debbie for spilling some juice. MICHAEL: ...Dad, are you there? PHILIP: ...yeah. (stumbling) Look, there's nothing I want more than to have you home... but it's complicated. MICHAEL: I really have changed. They only give you leave if you're doing ok.
PHILIP: Yeah, I know that, son. I'm really proud of you. I'll see what I can do. MICHAEL: (begging) I've been counting the days, Dad! *Try* to make Julie understand. PHILIP: I will. I promise. PHILIP: All right. I'll ring you back as soon as I can. You take care. And I meant what I said - I really am proud of you. MICHAEL: (deflated) Yeah. Bye Dad. Michael sadly hangs the phone up. Philip looks miserable as he hangs up too. Philip walks in and tells the rest of the family that Michael is allowed home for the weekend. Debbie is excited. JULIE: Not to this home. PHILIP: Well, he's got nowhere else to go. DEBBIE: You have to let him come home, Mum. JULIE: As far as I'm concerned, Michael is where he belongs. PHILIP: Two days! Is that too much to ask?! HANNAH: I don't want him here. He'll start scaring me, like he used to. DEBBIE: Nobody's asking you, nerd! JULIE: See! You only have to mention Michael's name and everybody's at each other's throats. PHILIP: (astonished) Julie, have a heart! JULIE: Philip, he is not setting one foot inside that door. PHILIP: He's my son, he's got rights too! JULIE: Not in this house. PHILIP: (appalled) What am I going to say to him?! JULIE: I don't know and I don't care. Wayne is making breakfast. Helen comes in, looking worse for wear. Wayne comments on her appearance and says that it looks like he wasn't the only one who had a sleepless night. HELEN: What kept you awake? Wayne angrily rants about how he can't believe that Gaby - the dedicated feminist and business executive - was selling herself off to the highest bidder. He details how he found her having champagne in Jack's hotel suite. WAYNE: She wants Philip's job. And what's the one thing she's got going for her that he can't match? She's a female! Helen doesn't think that sounds like Gaby. Wayne insists that she had every intention - and whether she went the whole hog or not isn't the point. Wayne notes that Helen doesn't look too chipper and suggests she take some aspirin and go back to bed. Helen does so. Freddo is shooting some baskets. Michael comes over and grabs the ball out of the air. Freddo wonders if everything's cool for Michael to go home. Michael starts bouncing the ball towards the basket at the opposite end of the court. Michael explains that Philip's going to call him back later as he has to check out some things. 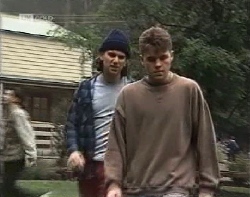 In the background, Darren and his gang approach the unknowing pair. FREDDO: But he won't knock you back? MICHAEL: Nah, should be all right. Michael turns with the ball, and Darren takes it off him. DARREN: Doesn't sound like you rate too high with your old man. MICHAEL: He's got a big job. He has to organise himself so he can be around while I'm home. DARREN: Get real! He doesn't want you around. You'll never hear from him. Michael angrily snatches the ball back out of Darren's hands. MICHAEL: (angrily) Shut up! What would you know?! Darren laughs softly and walks away. His gang follow. Michael continues bouncing the ball. FREDDO: I thought you and your dad were good mates? FREDDO: Well, why's he giving you such a hard time? MICHAEL: It's not my dad. It's Julie. My stepmother. She hates my guts. Michael lines up a shot. It misses and bounces off the backboard. There's an insistent knocking at the door. Helen comes out of the bedroom and answers it - it's Julie. JULIE: Oh Gran, you look awful! Julie wonders what's wrong and Helen tells her that she probably has a touch of flu. Julie thinks that's a blessing. Helen is confused. JULIE: (triumphantly) It means you can't take Michael in. Julie explains that Michael has been given weekend leave and she's made it clear to Philip that Michael won't be allowed back into Number 32. Julie thinks that if Helen has flu, he can't stay at 26 either. Helen thinks that it's fine to have Michael, especially as it's only for a couple of days. JULIE: Gran, you know what he's like. Leopards don't change their spots - I learnt that the hard way. HELEN: He must be behaving if they've given him leave. JULIE: That's what we thought when he came back last time. HELEN: Oh, darling, he *is* Philip's son! JULIE: (angrily) Exactly. And his responsibility. Now there is no way Michael ever gets inside my home again. And Gran, I won't forgive you if you agree to take him in. Jack is sitting in Philip's chair. Gaby comes in and Jack hands her back her handbag. Gaby seems ashamed, and thinks Jack will want to talk about what happened the night before. Philip gives her a level stare and then turns to Jack. Philip explains that his son is in a detention centre and it's paramount that he sees him that afternoon. Jack understands. Philip approaches Gaby and tells her that he's expecting a client to call. He wonders if she'll look after his client without poaching the sale. Gaby agrees, saying that sales poaching isn't her scene. Brad is hoovering and chatting to Wayne. 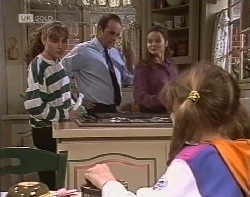 Brad says that Gaby spat the dummy that morning, and Wayne doesn't know why he bothers with her. Brad thinks that women are more temperamental than the nags! Wayne is surprised - he thought Brad had got the racing game sewn up. Brad tells him that he thought he had! BRAD: Man, I had this great little system going! And then all of a sudden...bang! Stops working for me. I've been losing a bundle. Wayne says that he had an uncle who used to do ok - and his system was to forget the horses and you should study the people - trainers, jockeys, owners etc - the people in the know. Wayne then talks about how it's all to do with body language too - so it's a good sign if the people around the horse are smiling. Brad seems stoked at having a new plan. Philip and Debbie are walking around the outside perimeter of the basketball court. DEBBIE: This place gives me the creeps. Philip thinks that the sooner Michael gets out, the better. Debbie is upset and can't believe that Julie couldn't put up with Michael for a weekend. PHILIP: She doesn't feel the same about him as we do, Deb. DEBBIE: Sometimes I wonder how you even put up with her. PHILIP: (shooting an odd look at Debbie) She's my wife. I love her. DEBBIE: (upset) But this is Michael, Dad! It's your home too! They're interrupted by an officer who's with Michael. Debbie excitedly runs over and embraces him. Philip, Michael and Debbie chat about the centre, and Michael reveals that he shares his room with Freddo - who's a bit of a fibber, but he's a pretty good bloke. Michael mentions that Freddo will soon be out. Debbie wishes that Michael was. Michael agrees! DEBBIE: As big a drag as ever! MICHAEL: So...what did Julie say, Dad? Can I come home? Philip looks very uncomfortable. He apologises and says that he did his best. Michael looks hurt. Wayne, Brad and Lauren are watching a race on the television. Brad excitedly points out a horse that he's put $50 on, and Lauren can't believe it - the horse is a 25/1 shot. Brad says that he liked the name! Wayne and Brad chat about how it's a sure thing as the jockey is smiling and Lauren is aghast - she thinks the pair are crazy! BRAD: Hey, that must be the trainer! Man, HAVE a look at the grin on his face! LAUREN: (as if she can't believe her ears) Brad, the favourite is a top horse! Her protests fall on deaf ears, as Brad is convinced that he's going to make a packet. Lauren is dumbfounded. Michael asks Debbie if she still sees Rick. She explains that they're no longer an item; just friends. Debbie raves about how he'll love Hannah's puppy as it's grown, and then winces, realising that they don't have a release date for him. Philip has been listening to the conversation and then interjects, pulling Michael to a stop. Philip apologises for him not being allowed home and says that he has to respect Julie's feelings too. Michael says that he understands. Philip repeats what the superintendent told him - that Michael's kept himself out of trouble and got his head down. MICHAEL: Yeah, I've grown up a bit. This place makes you do that. PHILIP: I'm really proud of the way you're handling it, son. In the background, Darren is lurking, eavesdropping. MICHAEL: Don't make too many waves. I had it coming with her. DEBBIE: I'm glad you've got your friend, Freddo, to talk to. MICHAEL: Yeah, I'm going to miss him when he gets out. The officer comes over and tells them that their time is up. Michael says it was good to see them. Debbie and Michael hug. Michael and Philip shake hands, and then Philip grabs him in a hug. He tells Michael to hang in there, and he and Debbie sadly watch as he's walked away by the officer. Gaby is dealing with a client on the phone. She's confident but then stumbles in the closing stages. She hangs up and admits to Jack that she thinks that client got away. Jack tells her that she can't win them all. Gaby stares despondently at the sales poster on the wall and remarks that she has to win a big account - she can't let Philip beat her. Jack compliments her on her drive and stamina, but Gaby doesn't think that's enough. Jack tells her that she needs some luck, and Gaby talks about making her own luck. The phone goes, and Gaby answers. Jack goes off to make a drink. 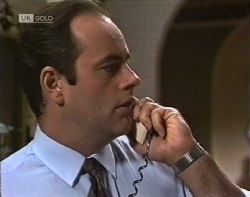 It transpires that the person on the phone is Philip's client that he asked Gaby to look after earlier. Gaby gushes about how she can go around and get his signature that afternoon, and sets up an appointment. She smiles. Philip and Debbie are confronting Julie. PHILIP: My son's in a detention centre with God knows what sort of people around him. All he needs is his parents' permission for him to come home at the weekend and I have to say no! Forget about whether I'd like him here - don't you think he has the right to come home? Julie looks at Philip, unimpressed. DEBBIE: (pleading) Mum, it's such an awful place! Two days wouldn't mean a thing to you but it'd mean everything to Michael. PHILIP: He's trying so hard; he needs all the encouragement and help he can get! JULIE: (calmly) I ran out of sympathy for Michael a long time ago. DEBBIE: How can you be so heartless, Mum?! JULIE: And how can you be so naive as to think he'd ever change? She stalks out of the back door. Philip and Debbie look distraught. PHILIP: (softly) I can't forget the look on his face. DEBBIE: I thought he'd go berserk. ...a year ago, he would have, wouldn't he? Philip nods and says that Michael's trying his best to stay on the right side. Debbie guesses that Michael didn't raise his hopes too much knowing how Julie felt about him. PHILIP: I can understand how she feels, but Michael has to have something to look forward to. DEBBIE: At least he's got his mate there. Freddo - the guy he shares with. Darren is sitting. Michael is walking past him. PHILIP: (voice over, cont) ...Michael must feel very alone. As Michael walks past Darren, Darren stands and starts to follow him. DARREN: (aggressively) Your old man really is a smart cookie. There's no way he's having you hanging around his big job and his fancy house! MICHAEL: We haven't got a fancy house. DARREN: Yeah? Well, it doesn't look like you've got any kind of home to go to, does it, mate?! Ohhh, what happened to your old lady? Couldn't be bothered to visit, hey? DARREN: (nastily) They must really think you're slime. Couldn't put up with you for a weekend. MICHAEL: (angrier) I said shut up! Michael walks into the basketball court. Darren follows him. DARREN: They don't care if you rot here, mate. No-one wants ya! No-one cares! Michael flips at Darren's taunts, turns around and grabs Darren. 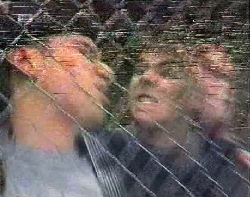 Michael throws Darren up against the wire mesh fence and angrily forces his face into it.